Speedtest puts the most sophisticated broadband testing and analysis tools into the hands of anyone interested in finding out the speed and quality of their internet connection. SpamCheck from Postmarkapp allows you to process the spam score of incoming or outgoing email messages, without the hassle of managing SpamAssassin. You can also utilize their light-weight JSON API to use SpamCheck in your own apps. LinkTally is a free tool that allows you to enter any URL (even from your competitors' sites) to find out how many times it was shared on Twitter, Facebook, Google+, and LinkedIn. WebPagetest allows you to find out how your website is performing. Run a free website speed test from multiple locations around the globe using real browsers (IE and Chrome) and at real consumer connection speeds. No account required. Google's Structured Data Testing Tool will allow you to see how Google views your website's structured data. You may also use this tool to see if your structured data is properly formatted and verify authorship/publisher details for your site. FollowerWonk helps you explore and grow your social graph and allows you to dig deeper into Twitter analytics. Find out who your followers are, where they're located and what they tweet. MixRank is a free tool that allows you to view data on your competitors contextual and display ads. You can see where their traffic is coming from and which ad copy is performing the best on thousands of Google AdSense sites. Are You A Human was designed to help stop website spam. By using a program that only Humans can play (not a CAPTCHA) and web bots can't crack, it keeps site visitors happy and hackers away. Supports Wordpress, Drupal, etc. Installation help available. 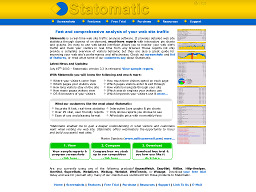 Statomatic.com Statomatic is a real-time web site statistics software, written in C/C++ for optimal performance. It provides detailed web traffic analysis and on-demand reports in HTML format with interactive pie charts and graphs. Statomatic can track visits to your web site independently, or it can use existing web server log files. Easy-to-use web based interface allows you to monitor your web site's traffic and track your visitors in real time. 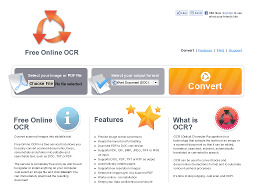 Free Online OCR Converts scanned images into editable text. This free service allows you to easily convert scanned documents, screenshots, faxes, and photos into editable and searchable text, such as TXT, DOC, or PDF. Simply select an image file, click Convert, and immediately download the resulting document. Del.icio.us A collection of favorite web site destinations - yours and everyone else's. You can use the site to keep links to your favorite articles, blogs, music, restaurant reviews, etc. and access them from any computer on the web.